Moreover, the apartment has an exceptional location in a pretty village with Spanish spirit and lots of tourist attractions. Take a gastornomic or landscaping tour, like the "Route of Sun and Avocado", go golfing, surfing or kayaking, take a horseback riding classes at the equastrian school La Paca, explore its caves and sand beaches, and visit its ancient constructions and museums. Rincón de la Victoria and nearby village of Nerja have the reputation of the areas with large perfect sand beaches, where you can relax or do the water sports. The center of Málaga with big shopping centers, port, night life, historic monuments and museums is 20 min by car or 30 min by bus. Holiday house for rent in Malaga. Ref. 73808. This elegant two-level house for rent decorated with a touch of traditional Spanish style is located in a quite and relaxing area of Malaga Capital, yet all local supermarkets, restaurants, bars and shops can be reached in about 15 min. walk. The beach is in only 8 min. by car/ 17 min. walk. Sleeps 8. This holiday house for rent offers 4 bedrooms and a bathroom with shower on the upper floor. Two bedrooms have a king size beds and private balconies. The third bedroom offers two single beds. The fourth has a bunk bed. The huge rooftop terrace is perfect for sunbathing, BBQ parties and dining al fresco. On the ground floor you will find a spacious living room with comfortable leather sofas where the whole family can sit together around the chimney and flat screen TV. The kitchen is fully equipped with all utensils you need for preparing your meals, as well as oven, microwave, coffee maker, dishwasher, and a small balcony. The dining area sits 6. On this floor you will also find a guest toilet. High-speed Wi-Fi and air conditioning throughout. Car is recommended for your comfort. Private garage for two cars is available for free. Also, there are buses nº 3 and 11 that can drive you to the city center. The bus stop is found in 12 min. walk on the highway N-340. Damage deposit for this holiday house for rent is 300 euros. The house is located close to the famous Playa Del Palo beach in Malaga with multiple chiringuitos (fish restaurants on the beach) and bars. The famous municipal market of El Palo is located 6 minutes away from the house. It has 70 stalls of meat, food, fruit and fish in the area of 1,680 square meters. On the ground floor there are the stalls, cafe, restrooms and common accesses with municipal parking, while the upper one is destined to the municipal managers and merchants. The house is 5km away from Malaga center . The distance to the airport is 13 km and to the train station 6 km. This holiday house for rent has everything to provide a perfect vocation with local sea food cuisine. 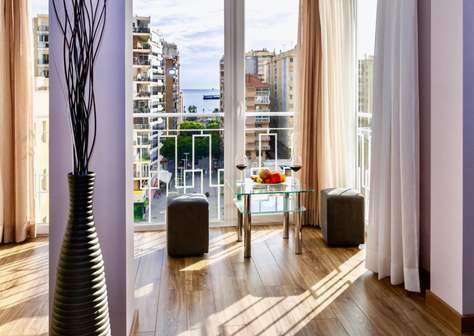 Holiday apartment for rent in Malaga. Ref.72927. This second line beach holiday apartment for rent has an exceptional location in Malaga centre offering stunning sea and bullring views. The apartment is within 5 mins walking distance to Malagueta, the best Malaga beach, and historic centre of Malaga is a 5 mins walk away. Plaza de Toros, the Bull Ring is just in front the windows and Gibralfaro, with its majestic views, just behind the building. With maximum capacity of 4 people, the place gives a relaxation vibe and has everything you might wish for your perfect vacation. The outstanding sensation of being in the middle of a vacation paradise comes from the connection of sea, sun and beautiful surroundings including spectacular sea and bullfighting's ring views. The apartment has a modern design and offers quality furniture. Master bedroom of this holiday apartment for rent offers a comfortable king size bed, the second bedroom has a double bed. Both bedrooms have big wardrobes. Fully equipped kitchen opens into a spacious living room with seating and dining areas, overlooking the bullfighting ring, the main avenue, and the Malaga seaport. The seating area offers a big comfortable sofa and flat screen TV. Tastefully decorated spacious bathrooms of this holiday apartment for rent offer a hot tub and also a shower. The kitchen has everything you need for preparing your meals, as it could be a coffee maker, an oven, a microwave, a stove, a dishwasher, a washing machine, a big fridge, cutlery and utensils. The location of the apartment offers a unique possibility of all kinds of water sport activities, restaurants, bars and public transport in being reached literally in a minute. Enjoy Malaga centre, you are in the heart of the city with great history and culture. Just imagine that a century ago Federico Garcia Lorca was performing at the very same Plaza de Constitución where Chinitas coffee grounds were located. Marques de Larios street is the greatest shopping street in Malaga, and it offers a variety of boutiques and cafés, with mix of tradition and modernity. 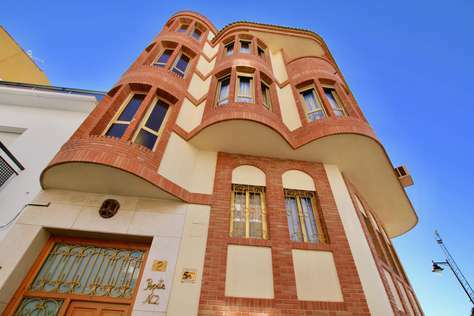 The apartment has an exclusive location close to well known Malaga Bull Ring and Plaza de la Merced, where the house Picasso was born in is located. Its windows have direct view of the bull ring giving an exceptional opportunity to discover festivities hosted here. Staying in the heart of a city with history where the great masters of the past left their marks is a true privilege. There is a plethora of drinking and dining establishments within a few minutes walk, and Calle Larios, one of the main shopping Streets, is nearby. A short 5 minutes walk leads to the beach, if you avoid going into any of the marvellous shops that adorn this area. All the most popular big Spanish/European stores are on Marques Larios, as well as some smaller boutiques and coffee shops. We highly recommend this as a stop for anyone looking to shop, or anyone looking for a nice walk where you can see the locals out and about. The Plaza de la Constitución - Constitution Square and Calle Larios, the city's main street which ends in the square are both pedestrian precincts, and this is a recommended spot for starting your walk through the Historic Quarter of Málaga. On one side, so as not to hinder the celebration of the many events held here, is the Fuente de Génova. Casetas (marquees) of the Feria de Málaga, the tribune of the authorities at Easter are some of the big events still hosted in Málaga's central square. After visiting the museums, we recommend to take a refreshment or a glass of sweet wine in the most famous bar in Malaga, the famous Pimpi winery! It truly is a unique place. The centenary decoration, typical Andalusian cuisine, high ceilings, landscaped patios, wine and signatures and photos of famous people who confirm the great history of this winery does not leave anyone indifferent! This lovely 2 bedroom holiday apartment for rent a big terrace offering sea views is conveniently located close to local supermarkets and a bunch of restaurants catering all tastes. The beach is only a 3 min walk. This holiday apartment for rent is tastefully decorated y refurbished with quality furniture. The seating area of the modern living room has a comfortable sofa bed and TV set, and a dining area. High-speed Wi-Fi and air conditioning throughout. Lovely fully equipped kitchen offers many extras including juice maker, toaster and dishwasher. Master bedroom offers relax in the king size bed feeling the comfort of its mattress and pillows, your Spanish vacation has just begun! Master bedroom and living room have access to a generous size terrace with stunning panoramic sea views. The terrace offers the second dining area to enjoy al fresco. The second bedroom features 2 single beds. 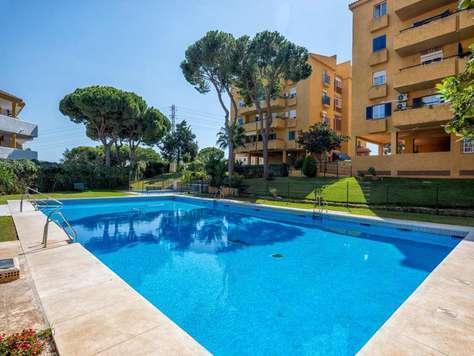 Centrally located in Calahonda , the property is within 3 mins to local bars, restaurants & supermarkets, a walk through the complex will take you to the Calahonda square where you can sample a variety of Bars & Restaurants. 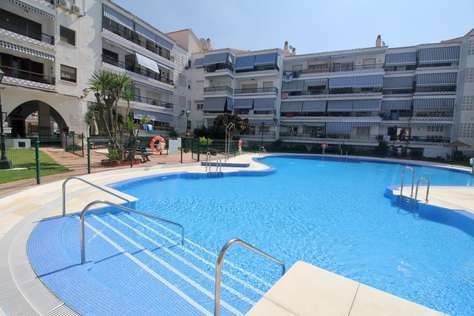 This holiday apartment for rent is situated in Calahonda centre, in a 5 mins walk from the beach. This holiday apartment for rent is only in a minute walk to the local shopping centre with its nice restaurant and supermarket. The perfect sandy beach and the main shopping plaza with supermarkets, numerous restaurants, bars and nightlife is only a 3mins walk from this holiday apartment for rent. A beautiful newly built wooden promenade 6 kms along the seashore gives a unique opportunity of walking or running, chasing sunsets or enjoying dawn over the sea. The well known local village Calahonda is located mid way between Fuengirola and Marbella (10 kms to either way). If you are looking for a selection of bars to sip a chilled beer a 5 min walk will lead you to Davids & Georges & afew more new bars & restaurants or sit on the outside decking over looking the sea at Max Beach Bar. Close by you'll find the areas of El Zoco & Calypso where they provide refreshing alteratives with local & international cuisine available daily.The very picturesque marina of Cabopino (known as mini Puerto Banus) & old traditional Spanish village of Mijas where local delights can be sampled all within easy access.